Female parakeets are notoriously more aggressive than males. One bite from your peeved parakeet is enough to let you know she’s having a bad day. Certain factors can trigger unusual behavior in a domesticated bird who's not normally aggressive. Safety is a top concern when dealing with bird aggression, especially when a hostile pet inhabits a multi-bird cage. Territorial aggression is one of the most common behavioral problems for owners of multiple birds. Some species are more prone to this type of aggression, including Quaker parakeets. Your bird may be aggressive toward humans or toward other birds in her home. Female parakeets tend to be queens of the cage, defending the perch, food bowl and other furnishings. In multi-bird cages, you can diminish territorial aggression by ensuring the cage is roomy and each bird has her own set of food and water bowls. If necessary, your feathered friends may need to be separated. Female parakeets can become stressed and irritable as their hormones fluctuate. If your bird’s hormones are on the rise, she may want to breed. In this case she might display some aggressive behavior. 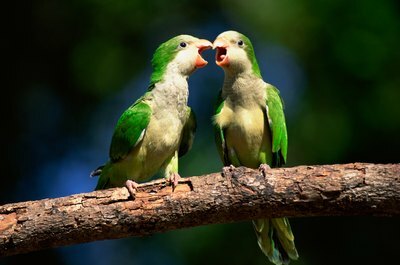 Paired parakeets will mate, while single hormonal parakeets may attempt to mate with a bird toy or perch. Females may produce eggs that will be infertile if she is without a partner. To help curb your parakeet’s aggression, Dr. Samuel Vaughn of the Veterinary Associates Stonefield in Louisville, Kentucky, recommends leaving your bird alone for three to six weeks. Hormonal birds should have their daylight reduced to 10 to 12 hours daily to end her hormonal cycle. Just like humans, some birds are just not compatible with one another. Parakeets that clash may stay on separate sides of the cage to avoid interaction. They will not socialize with one another, nor groom socially like most well-bonded birds. Sometimes, even the most compatible birds will fight amongst themselves to claim dominance. If your parakeet is showing this type of aggression, it may be best to provide your quarrelsome bird with her own cage. Birds don’t necessarily need another playmate to be healthy and happy. Simply hang a mirror in your parakeet’s cage and she’ll enjoy her nonthreatening friend. Parakeets may display their aggression in a variety of ways, such as raising their wings, hissing, biting, chasing or picking at another bird’s feathers. Your bird may show her aggression due to a poor diet, pain and discomfort, or mere frustration. Aggression can be a learned act if your bird has witnessed members of his flock behaving in an antagonistic manner. If your parakeet is a new addition to your household, the reason for her aggression is most likely fear. As your anxiety-ridden companion becomes more comfortable with your presence, her aggression will begin to subside. Based in northern New York, Brandy Burgess has been writing on pets, technical documentation and health resources since 2007. She also writes on personal development for YourFreelanceWritingCareer.com. Burgess' work also has appeared on various online publications, including eHow.com. Burgess holds a Bachelor of Arts in computer information systems from DeVry University and her certified nurses aid certification. What Is the Perfect Cage Size for Two Parakeets? What Do the Letters & Numbers Mean on a Parrot Leg Band? How Fast Do Parakeet Feathers Grow?